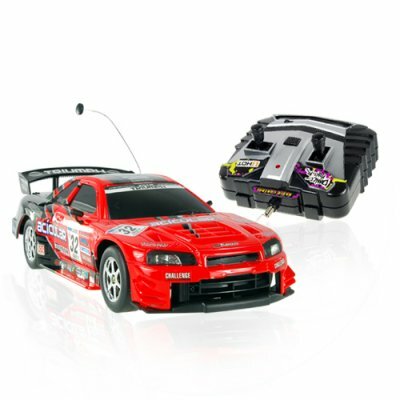 Successfully Added Radio Control Drifting Toy RC Racing Car (110V) to your Shopping Cart. Radio Control Drifting Toy RC Racing Car for more racing and drifting fun than you can handle! This speed machine feels at home on any raceway or track around the world. Made of durable molded plastic for the occasional smash, crash, and bash, it employs a vented hood for greater maximum speeds. Use the remote controls two thumbsticks to control forward and reverse throttle along with left and right steering. Lurch forward and halogen lights cut a path into the night. Watch in amazement as an bluish underglow bathes the car in an eerie light. Perfect for those midnight runs or side street quarter miles. But the real genius behind this radio controlled racing car's design is its independent front and rear suspension. Aside from acting as a really good shock absorber allowing the vehicle to tackle hills and dips with ease, it also sets the stage for a great visual display -- press a button and watch the car hydraulics kick in to raise and lower the car in time with some very funky music. Get one to play with in your own office and then buy a few more to re-sell on eBay, Amazon, uBid, or your own physical/internet store. Chinavasion's factory-direct prices let you buy more speed for less dough. The default charger for this product is for 110V. If you need a 220V power adapter then order CVGP-T21-220V. Please don't forget to check the rest of our fantastic RC toy category for the best bargains - direct from Chinavasion! Shipping by Air Container or Sea Container Available. or get a quote from Chinavasion's freight partner. Can it be used outdoors after it has rained? It is not advisable as some water may get into the circuit system and damage the RC Racing. What is the wheel adjustment for? The wheel adjustment will help you straighten the front wheels, as time can cause wear and tear. This way you get much more longer use out of this durable and amazing RC toy racing car for years to come.